As per their usual modus operandus, the Republicans have completely caved in to the demands of the Democratic Party over the partial "Government Shutdown". The Democrats will get everything they have demanded, and more. Even Ted Cruz, testing the winds, has embraced Obamacare. American conservatives are weeping and gnashing their teeth, and the cynics (myself included) are pointing out that all the sound and fury were destined to signify nothing. Democrats are no doubt celebrating: their tears will come later when Obamacare's true cost becomes impossible to deny. Transiting Mars ingressing from Leo to Virgo: the action principle moving from self-aggrandizement to practical work. Of course, libertarians would rather the talking heads in DC go back to non-productive self-aggrandizement and leave us be. Transiting Sun just past the US solar arc Moon/Pallas conjunction: the "fight" has peaked and is on the wane. Transiting Venus over the US Ascendant: money is at the forefront. 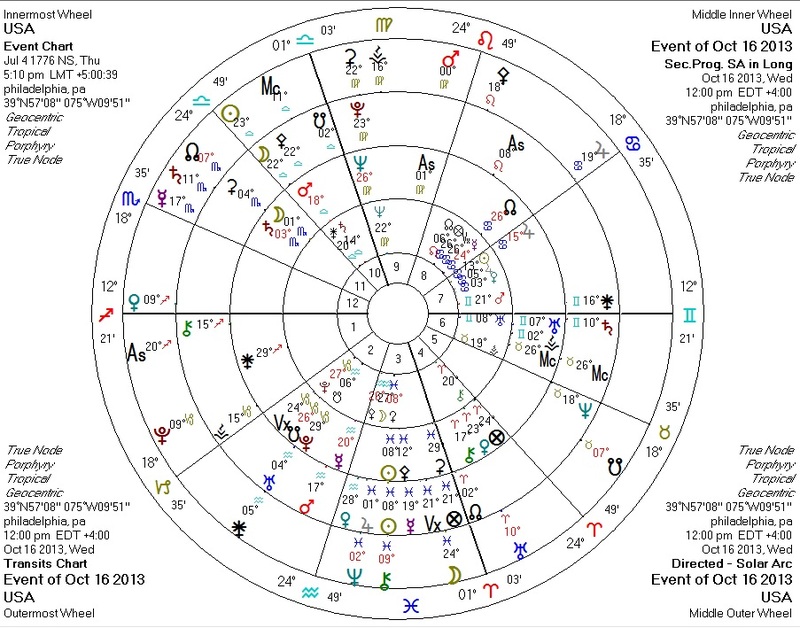 Transiting Jupiter crossing into the US Eighth House: the beginnings of massive debt expansion. Libertarians and many conservatives know that a government default is inevitable. Liberals will soon learn that what you don't know (or choose not to know) can hurt you. Note that the current Uranus-Pluto square will be moving to hit the USA Sun next year. The farce of the past few weeks is only a mild foreshadowing of the challenges to come. We ain't seen nothin' yet.